Mystery Antique Chair, Can You Help? This antique chair is a total mystery to me. It belonged to my grandparents and I inherited it approximately 20 years ago. I have always called it the “king” chair. I am not an antique furniture expert but did do some research and cannot find anything like it. Any information anyone would have would be greatly appreciated. Thank you! 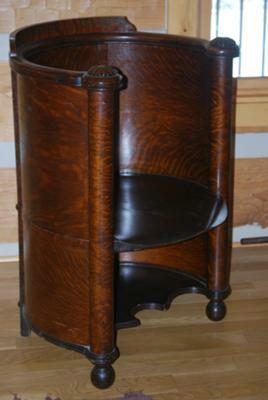 It definitely looks like an antique Barrel Chair and in good condition too. The patina to the wood looks terrific. I wonder what the lower shelf was intended to hold? Some Info by: Sherry M.
I did speak with an antique furniture dealer and he told me that it was a chair from the 1920’s or 1930’s era called a barrel chair and it is made from quarter sawn oak … interesting. I have seen a Liberty & Co arts & crafts barrel shaped tub chair that features a series of vertical splats and terminates in shaped feet. I believe it was very similar to some Baillie Scott designs . The Stanmore Chair is similar and illustrated in the Liberty & Co gifts catalogue of 1900. Other similar antique chairs are also illustrated in; British Furniture by Pauline Agius including a chair known as The Tenaty Chair by the Goodearl Brothers c1905. And another Liberty & Co example was featured at a Liberty & Co. arts & crafts exhibition in 2006. It was also illustrated in Liberty’s Furniture 1875-1915, published by The Antique Collectors Club. I like the colour and patination on Sherry’s chair. She should take it to a good auction house to be appraised properly.